Here is the handout from the class I teach on knitting gauge. If it is useful to you, please feel free to use it for your personal use as well as share and learn from it! What is gauge and why does it matter? Gauge is the number of stitches and rows in a square inch of knitting. If you are following a pattern it helps determine, along with the number of stitches you cast on, how big or small your finished product will be. 1. Change the needle size. If you have too few stitches, your stitches are too big and you need to try a smaller needle size to make smaller stitches. If you have too many stitches, your stitches are too small, they need to be bigger so try a larger needle size. The brand and kind (bamboo, stainless steel, exotic woods) of needle can also affect gauge. 2. Change the yarn. If you have too few stitches maybe your yarn is too thick so you could try a thinner yarn. If you have too many stitches, you could try a thicker yarn. Generally, it is preferable to substitute yarns with the same properties as the original yarn. 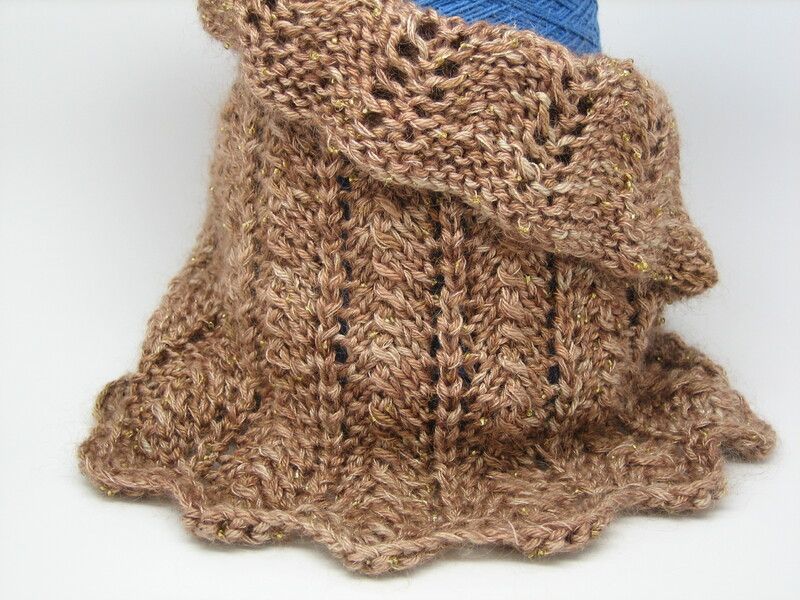 For example if the pattern uses a stretchy wool yarn, substitute another stretchy wool yarn. The fiber properties affect how the item will fit, wear and drape. 3. Change the pattern. If you like the way the knitted fabric feels and drapes with the yarn and the needles you have chosen and you do not want to change them then you can change the pattern gauge. You can recalculate the number of stitches to cast on for your pattern based on the gauge of your fabric. Sometimes you may find that either a size larger or a size smaller in the pattern will give you the finished size you want. Just because you can get pattern gauge with a substituted yarn, doesn’t mean it will make a nice garment. Gauge is important but so is how the fabric feels! The gauge and needle size suggested on the yarn label is a place to start. However, since knitting styles vary you may need to use a different needle size to get the suggested gauge. When measuring a gauge swatch, treat your swatch the way you will treat your finished product. For example, if you are going to wash and dry your item, do that to your swatch before measuring. 1. Look at the schematic of the pattern in inches, or calculate the number of inches based on the pattern gauge. 2. Multiply the number of inches by your stitches/per inch gauge to get the new number of stitches to cast on. 3. Adjust all shaping to your new gauge. 4. If the new gauge is significantly different than the pattern gauge you may need to account for row gauge. Generally measuring the piece in inches will work out fine. TNNA has been an amazing exhausting whirlwind experience. This is the second TNNA I’ve been to and I keep learning new things about the yarn industry. It’s so interesting to see the new trends (think sparkle, ruffles, cotton blends and the 1970’s) as well as meet young designers and other indie dyers. I’ve picked up some new ideas for rigid heddle weaving and knitting classes and ways to improve my business. I’m really excited about teaching weaving and hopI’ll be able to inspire a few fellow knitters to expand their repretoire . I’ve crafted with yarn most of my life, and now working in the business has given me a new perspective. I’m still sorting out how I fit in and what my goals are. In the meantime it’s fun to be with liked minded people and imagine the possibilities. In case you haven’t heard The Golden Fleece, 317 Potrero St, Santa Cruz, CA, has a new owner. Tomorrow (Sat, June 4) is the Grand Re-Opening Event. I’m thrilled to be a part of it and will be there with trunks of yarns and patterns from 12-2pm. If you are in the area, chase away the rain clouds and come on by. Its going to be fun.